Discourses from the 10-day Vipassana mediation course are also available in many languages on CD and as streaming audio, and in English and Hindi on DVD. This eBook is in Mobi (Kindle), ePub (iPad, Android, other eReaders) and PDF formats. You will be sent download links for each format after purchase. Although I also ordered the e-book and flash drive versions, the small paperback hard copy is great for settling down at night, taking it with me for trip, or simply restricting time on the computer. 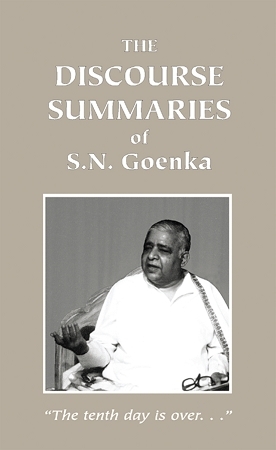 It is very helpful to read, for learning content - to constantly be reminded of the activities of the mind and Goenka's encouragement and wisdom. What a wonderful presentation of the retreat discourses. This book allows for a deeper understanding and greater discernment of the core teachings, as one is able to stop and contemplate the subtleties expounded by Goenka. Few books are more potent for their brevity and succinct power. The vipassana course transcribed in this book is invaluable for the deaf and hard of hearing (D/HH). Every once in grand while when disciplined and focused, I relive the course(s) by reading an evening lesson of uncanny wisdom. Thank you so much, Paryatti. The best book of its kind we have in this country. This book should be the everyday companion of any Vipassana meditators who have already joined the S.N Goenka's retreat. This is a wonderfully great book. Highly recommended. A true remedy for the psyche. A true remedy for the psyche. A breathtakingly inspirational guide for well-being. The simplicity in words is alleviating and the intricate complexities between each line will surely swell your mind. I wanted a review of the 10-day retreat, I found this book provided me the tools i needed. Wonderful, Inspiring, I suggest it to every friend interested in taking the 10 days course. Excellent to own after one has taken the first course in Vipassana meditation, as a review of the course. The book reviews and helps one continue on the path.